This paper presents a project developed within the Master of Advanced Studies in Architecture and Digital Fabrication programme at ETH Zurich. The Brick Labyrinth is the first large-scale construction built in the Robotic Fabrication Laboratory, a unique multi-robotic setup for automated prefabrication at architectural scale. The project continues the tradition of robotic brick laying started at Gramazio Kohler Research but increases the significance of computational design and robotic control by solely working with a dry-stacked construction method. 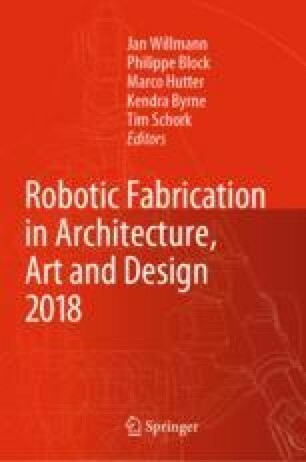 The paper introduces the design methodology, the computational framework and the robotic fabrication setup and addresses the structural challenges of the constructive system. It introduces strategies for an automated multi-robotic brick laying process at large-scale including custom-made robotic end-effectors to increase the speed of the process. The unique setup of the project and its material system demonstrate a fully reversible construction process at architectural scale, suggesting a new approach to physical prototyping, which could fundamentally change the way we design buildings. While this paper highlights the design explorations leading towards the final structure – featuring the development of a flexible dry-stacked brick bond and its potential to create unique spatial sequences – it also provides an outlook on how the integration of computational tools into automated fabrication processes can lead to new design typologies. The Brick Labyrinth described in this paper was developed and built as a design and fabrication project of the Master of Advanced Studies in Architecture and Digital Fabrication at ETH Zurich in June 2017. The programme is run jointly by Gramazio Kohler Research and Digital Building Technologies and directed by Hannes Mayer. The project was developed and executed by the students of the MAS year 2016/2017: Marco Caprani, Samuel Cros, Rodrigo Diaz, Ahmed Elshafei, Federico Giacomarra, Hakim Hasan, Marirena Kladeftira, Iakovina Kontiza, Thodoris Kyttas, Matthias Leschok, Coralie Ming, Wataru Nagatomo, Matteo Pacher, Maria Pachi, Sambit Samant, Theodora Spathi and Dai-Syuan Wu. The team of researchers and tutors consisted of Luka Piškorec, David Jenny and Stefana Parascho, with Hannes Mayer. Students were mentored by Prof. Fabio Gramazio, Prof. Matthias Kohler and Prof. Benjamin Dillenburger. Special thanks goes to the RFL technicians Michael Lyrenmann and Philippe Fleischmann and Andreas Reusser from IfB, as well as to our sponsor Keller AG Ziegeleien for supplying the bricks and for the long research partnership in robotic brick building.